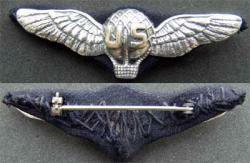 During the First World War no real standard wings existed for the US Army Signal Corp. Air Service. Many wings were cloth but many jewelers made metal wings during the war at the request of pilots. The real wings were based on Special Regulation #41 issued on 15 August 1917 and were to be made on cloth with embroidery. But right from the beginning Pilots had jewelers make the wings because the embroidered wings did not hold up when washed. The wings that are shown are a museum quality reproduction of Balloon Pilot Wings. The original designer is not known, it is 3 inches. This museum quality reproduction is made of Sterling Silver with the letters US gold plated. The silver parts are mounted on a brass plate which is covered by the wool cloth.